Question: What do you call two straight days of rain in Portland? I'm sure there are more; these are just the ones I've heard this week. The trouble right now -- and it's no laughing matter -- is that Oregon is enduring a drought that is making people long for those rainy days. 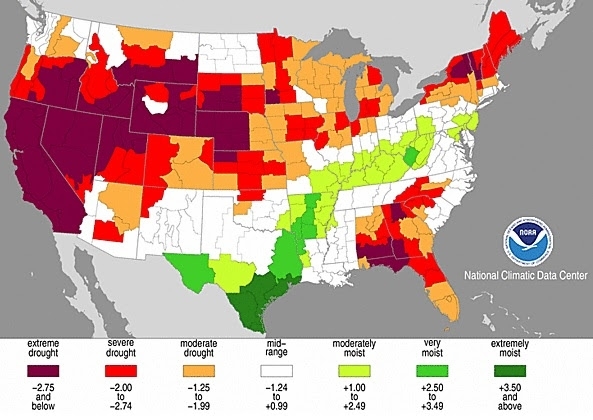 As you can see on this map from NOAA's Palmer-Z Index (a measure of the degree of drought) most of Oregon is right now experiencing drought conditions that are "severe" or "extreme." I haven't spent a lot of time in Oregon, but early this morning when I headed out on a run to experience Portland's famous Wildwood Trail, I could tell that conditions were unusually dry. The trail surface itself -- likely moist and springy most times of the year -- was hard, cracked and dry. Moss hanging down from various branches is probably green and moist most of the time; today that moss was brown like dry grass. The Wildwood Trail is still gorgeous -- it just felt much more like my "home trails" of arid Colorado, not the lush wonderland I was expecting. Hope Oregon's rain returns soon! The Wildwood Trail extends for more than 30 miles! I need to return when I have time enough to run the whole thing. Perhaps hard to tell here, with the green conifers, but I couldn't believe how dry conditions felt. Fortunately, there's apparently enough moisture for this banana slug. What a beauty! Praying for rain in tinder-dry Oregon... I'll see you on the trail!